When I get a bruise and it's on my fingers or my toes, then it grows out under the nail and it comes out like a scab when I cut my nails. But if I get a bruise on my leg or anywhere else then it just turns purple and then yellow, and then it's gone. So, obviously, it gets broken down and gets out somehow, but how does that happen? 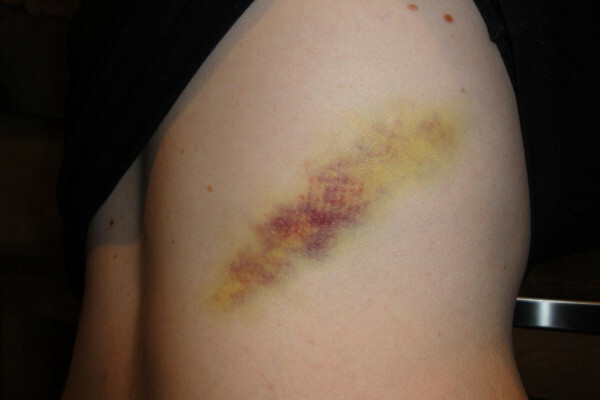 A bruise is indicative of trauma. So, some kind of trauma has to happen which allows blood to escape from a blood vessel into what's called the extravascular space. So, it spills out and splurges out around the subcutaneous tissue in the body. It can also happen in other tissues. You can get bruising of your internal organs, contusions of organs, including the brain, for example. But once blood leaves a blood vessel, the first thing that happens is that it starts to lose the oxygen that's locked up in the haemoglobin. And when haemoglobin is full of oxygen, it's a nice red color. So, that's why the injury first looks red. As the haemoglobin gets deoxygenated, it goes a bluey hue and then purplish. And that's the darkening that's happening. The next step is that the inflammation and damage also attracts the immune system. So, white blood cells come in, trigger some more inflammation and they begin to eat up, engulf the red blood cells. And when they do that, they break open the cells. And out of the cells comes the haemoglobin, the red pigment. And the protein part of that gets chewed up inside the cell, turned into amino acids and they get recycled or metabolised. And this leaves just the central core of the haemoglobin called the haem group, which is what's known as a porphyrin ring. It's a series of chemical carbon rings which have got locked away in their centre, an iron atom. That's why it's red because of the iron. Now, what happens is an enzyme then kicks in called microsomal haemoxygenase, and this breaks open that ring, and it releases the iron which then goes off into the tissue and gets locked up with something called haemosiderin. And that looks an orange colour. So there's the orange colour in your bruise. But the ring of haemoglobin, the haem group, initially gets turned in something called biliverdin, which is a green color, so there's the green in your bruise. And that very quickly gets reduced to bilirubin, the yellow stuff. And then that's why you also see yellow in your bruise. And as the bruise ages, it's also affected by gravity because these materials begin to spread out in the tissue doing a, sort of, human chromatography experiment. They spread out and different molecules get stuck to different things and travel at different rates. And so, the bruise spreads out and you see the separation of colours and the evolution of the colours. But, eventually, all those substances just soak away and are taken away by cells in the bloodstream, and that's why the bruise eventually fades away and then you get better. So there's your answer! Previous Why do spiders have such potent venom? Next Would a siphon work in a vacuum?